During the 2014 Legislative Session, $40 million for the State Capitol Project was appropriated as part of a bond package after garnering bi-partisan support from then-Governor Nixon and the General Assembly. In August of 2015, the first bond sale to fund a portion of the Capitol project was approved by the Board of Public Buildings (members at that time included then-Governor Jay Nixon, then-Lieutenant Governor Peter Kinder, and then-Attorney General Chris Koster). The construction period of Phase II of the Missouri State Capitol Construction Project will begin on Friday, March 2nd, 2018. During this incredibly complex and long-term project, the south lawn of the Capitol building will be converted into a construction staging area in order to allow for heavy equipment & materials to be stored on-location. As such, the south circle drive will CLOSE to public traffic from Friday, March 2nd until late 2020. Eastbound traffic approaching the Capitol Building from West Main will be diverted right onto Broadway Street. 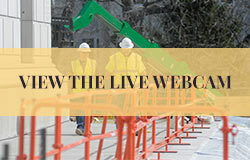 Westbound traffic approaching the Capitol Building from Capitol Avenue will make a slight diversion on Senate Garage Drive and then proceed around the north side of the Capitol. As a precaution, please note the speed limit on the north drive is 20 mph and traffic will be limited to one lane only. 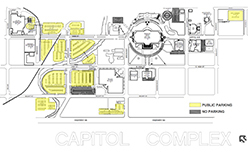 Visitors will continue to enter the Capitol through the south carriage & west public entrances. ADA access will continue to be available at the south carriage entrance and through the Capitol garage, at the lower level of the east side of the building. ADA parking spaces will continue to be available on the north circle drive. 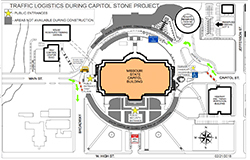 Designated school bus drop-off area will move to the west end of the Capitol near the base of the West stairs (buses will need to use the north circle drive to access this location). When there is business of the state being conducted in the Capitol after 5:30 p.m., the public will be allowed to enter through the east basement door. This entrance will continue to serve as an ADA access point to enter and exit the building. As a reminder, public Capitol entrances are staffed by security personnel utilizing both magnetometers and X-ray conveyors for security screening. The public entrances are also used by contract employees, special guests, members of the media, and lobbyists – all who are subject to screening. 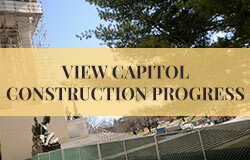 For more information on accessing the Capitol Building, visit the Missouri Department of Public Safety website. After more than 100 years of wear & tear, the exterior façade and substructure of the historic Missouri State Capitol Building (the seat of Missouri State Government in Missouri’s capital city, Jefferson City) have suffered significant deterioration. The Capitol’s first major construction project will bring the building’s structure back to serviceable condition and address the deteriorating stonework on its facades, dome and drum, which was completed in 1917. Upon completion (anticipated in late 2020), the project will essentially extend the life of the building as well as improve the overall appearance, structural stability and water shedding capacity, ensuring that the historic structure is properly preserved so it can continue to be enjoyed by generations to come.